Sheriff: "We believe at this time that it's a real event"
(CNN) -- Authorities plan to ask new questions of the family at the center of the balloon drama that captured the world's attention Thursday, as a comment in a CNN interview and other concerns raised speculation that the incident may have been staged. 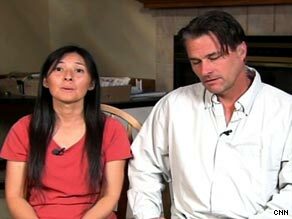 Parents Mayumi and Richard Heene discuss the upheaval in their lives Friday on CNN's "American Morning." "We feel it's incumbent on us as an agency to attempt to re-interview them and establish whether this is in fact a hoax or actual event," Larimer County Sheriff James Alderden said at a news conference Friday. "We believe at this time that it's a real event." Investigators with expertise in spotting deceptive behavior interviewed the family Thursday and believe they were not lying, Alderden said. His office is being flooded with calls and messages from people insisting it must be, and putting "a lot of pressure" on authorities to charge Richard and Mayumi Heene, he said. The sheriff's office said it was conducting background checks on the Heenes. A giant Mylar balloon took off from the backyard of the Heenes' northern Colorado home Thursday. The couple said they were terrified their 6-year-old son Falcon may have been on it. They couldn't find him. In audio from 911 calls released Friday, the parents sounded emotional and desperate. When the balloon finally landed, Falcon was not on board. Later, he came out from hiding in an attic over the home's garage. "I'm feeling very, very grateful that Falcon is among us," Richard Heene told CNN's "American Morning" on Friday. "We went through so many emotions yesterday." The family chases storms and takes videos of some. The Heenes also were featured in March on the ABC program "Wife Swap." After the Hollywood gossip Web site TMZ.com reported that the Heenes had been "pitching a reality show about the wacky family," one of the networks mentioned, TLC, which produces "Jon and Kate plus 8," said "they approached us months ago, and we passed." Two other production companies, Reality Real and RDF, which produces "Wife Swap," did not immediately respond to CNN's queries. They family had a video camera recording as the balloon took off Thursday. Alderden said that was because the family planned an experiment in which the balloon was to rise 20 feet off the ground. Richard Heene said his son was confused when he made the show remark. There were media assembled on the front lawn, asking all sorts of questions, and that's what Falcon was referring to, Heene said Friday morning. Heene, a meteorologist who takes his family along to chase storms, said he was concerned when the balloon took off because "the project was pretty much down the tubes." Then their son Bradford said he thought Falcon was inside, sparking the family's terror -- and the world's response, as people tuned in to live TV coverage of the balloon, which looked like a cross between a mushroom and a flying saucer. Alderden told CNN's Wolf Blitzer on Friday that, based on reports that the parents "took these children into potentially dangerous situations" with tornado chases, the experimental balloons and other activities, it would be "appropriate to involve child protection [services] to at least see what the family situation is and whether the children are in a safe condition." Earlier, Alderden told reporters that his department has contacted the child protection officials but asked them not to contact the family until investigators have had a chance to re-interview them. Alderden, at Friday's news conference, said he did not believe Falcon could have been following instructions by going into hiding. "I just can't see this particular boy being told go sit up there for five hours and be quiet. I just don't see that, as hyperactive as he is," the sheriff said. He also called it unlikely that the other two brothers, ages 8 and 10, would have pulled off such a hoax. If it were determined that the incident was a hoax, "the only thing we have is them making a false report to authorities, which is a Class 3 misdemeanor," Alderden said. But, he said, authorities could seek to recoup the money spent. "If there is criminal conduct, we certainly would seek restitution," he said. The balloon landed in a plowed wheat field, and the owner could seek compensation from the family, Alderden added. Alderden also said his office had contacted an expert at Colorado State University during the incident to make sure that the dimensions of the balloon were adequate to handle a child of Falcon's weight, he said. The sheriff also sought to defend his department. Authorities had been at the house and had conducted searches for the boy three times during the incident. "Obviously it wasn't as thorough as we would have liked it to be," he said, "because the boy was hiding in the attic in the garage." Investigators had seen the rafters in the garage, but there was no ladder to get up there. "Our personnel just didn't think it possible that a 6-year-old boy would be able to get up into that space, so they didn't look there," he said. Despite numerous conspiracy theories flying around on the Internet, Alderden emphasized that authorities have not seen suspicious behavior by the Heene family. "They appropriately expressed statements, nonverbal communication, body language and emotions during this event that were entirely consistent with the events that were taking place," he said. "Certainly, people are free to speculate, they're free to be skeptical about it," Alderden added. "But those of us in the law enforcement profession have to operate on facts and what we can prove."